Not to be confused with Pomerelia. "Pommern" and "Pomorze" redirect here. For other uses, see Pommern (disambiguation) and Pomorze (disambiguation). Pomerania (Polish: Pomorze; German, Low German and North Germanic languages: Pommern; Kashubian: Pòmòrskô) is a historical region on the southern shore of the Baltic Sea in Central Europe, split between Germany and Poland. The name derives from the Slavic po morze, meaning "by the sea" or "on the sea". Pomerania stretches roughly from the Recknitz and Trebel rivers in the west to the Vistula river in the east. The largest Pomeranian islands are Rügen, Usedom/Uznam and Wolin. The largest Pomeranian city is Gdańsk, or, when using a narrower definition of the region, Szczecin. Outside its urban areas, Pomerania is characterized by farmland, dotted with numerous lakes, forests, and towns. The region was strongly affected by post–World War I and II border and population shifts, with most of its pre-war inhabitants leaving or being expelled after 1945. Pomerania is the area along the Bay of Pomerania of the Baltic Sea between the rivers Recknitz and Trebel in the west and Vistula in the east. It formerly reached perhaps as far south as the Noteć river, but since the 13th century its southern boundary has been placed further north. Most of the region is coastal lowland, being part of the Central European Plain, but its southern, hilly parts belong to the Baltic Ridge, a belt of terminal moraines formed during the Pleistocene. Within this ridge, a chain of moraine-dammed lakes constitutes the Pomeranian Lake District. The soil is generally rather poor, sometimes sandy or marshy. 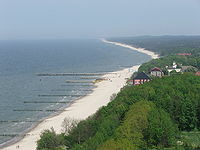 The western coastline is jagged, with many peninsulas (such as Darß–Zingst) and islands (including Rügen, Usedom, and Wolin) enclosing numerous bays (Bodden) and lagoons (the biggest being the Lagoon of Szczecin). The eastern coastline is smooth. Łebsko and several other lakes were formerly bays, but have been cut off from the sea. The easternmost coastline along the Gdańsk Bay (with the Bay of Puck) and Vistula Lagoon, has the Hel Peninsula and the Vistula peninsula jutting out into the Baltic. Hither Pomerania (Vorpommern) in northeastern Germany, stretching from the Recknitz river to the Oder–Neisse line. This region is part of the federal state of Mecklenburg-Vorpommern. The southernmost part of historical Vorpommern (the Gartz area) is now in Brandenburg, while its historical eastern parts (the Oder estuary) are now in Poland. 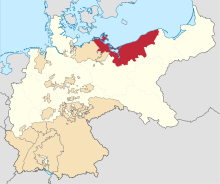 Vorpommern comprises the historical regions inhabited by Slavic tribes Rugians and Volinians, otherwise the Principality of Rügen and the County of Gützkow. The West Pomeranian Voivodeship (Zachodniopomorskie) in Poland, stretching from the Oder–Neisse line to the Wieprza river, encompassing most of historical Pomerania in the narrow sense (as well as the northern half of Neumark). The Pomeranian Voivodeship, with similar borders to Pomerelia, stretching from the Wieprza river to the Vistula delta in the vicinity of Gdańsk. The northern half of the Kuyavian-Pomeranian Voivodeship, comprising most of Chełmno Land. The bulk of Farther Pomerania is included within the modern West Pomeranian Voivodeship, but its easternmost parts (the Słupsk area) now constitute the northwest of Pomeranian Voivodeship. Farther Pomerania in turn comprises several other historical subregions, most notably the Principality of Cammin, the County of Naugard, the Lands of Schlawe and Stolp, and also the Lauenburg and Bütow Land (the last, however, is sometimes regarded as a part of Pomerelia or Kashubia). Parts of Pomerania and surrounding regions have constituted a euroregion since 1995. The Pomerania euroregion comprises Hither Pomerania and Uckermark in Germany, West Pomerania in Poland, and Scania in Sweden. "Pomerania" and its cognates in other languages are derived from Old Slavic po, meaning "by/next to/along", and morze, meaning "sea", thus "Pomerania" literally means "seacoast" or "land by the sea", referring to its proximity to the Baltic Sea. Pomerania was first mentioned in an imperial document of 1046, referring to a Zemuzil dux Bomeranorum (Zemuzil, Duke of the Pomeranians). 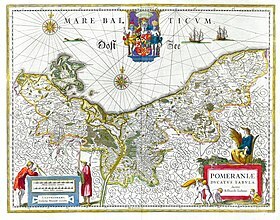 Pomerania is mentioned repeatedly in the chronicles of Adam of Bremen (c. 1070) and Gallus Anonymous (ca. 1113). The term "West Pomerania" is ambiguous, since it may refer to either Hither Pomerania (in historical and German usage) or to the West Pomeranian Voivodeship (in common Polish usage). The term "East Pomerania" may similarly carry different meanings, referring either to Farther Pomerania (in historical and German usage), or to Pomerelia or the Pomeranian Voivodeship (in Polish usage). Settlement in the area called Pomerania for the last 1,000 years started by the end of the Vistula Glacial Stage, some 13,000 years ago. Archeological traces have been found of various cultures during the Stone and Bronze Age, Baltic peoples, Germanic peoples and Veneti during the Iron Age and, in the Dark Ages, Slavic tribes and Vikings. Starting in the 10th century, early Polish dukes on several occasions subdued parts of the region from the southeast, while the Holy Roman Empire and Denmark augmented their territory from the west and north. In the 12th century, narrow Pomerania became Christian under saint Otto of Bamberg (the Apostle of the Pomeranians); at the same time Pomerelia became a part of diocese of Włocławek. Since then, the Griffin Duchy of Pomerania stayed with the Holy Roman Empire and the Principality of Rugia with Denmark, while Pomerelia, under the ruling of Samborides, was a part of Poland. Pomerania, during its alliance in the Holy Roman Empire, shared borders with Slavic state Oldenburg, as well as Poland and Brandenburg. The Teutonic Knights succeeded in integrating Pomerelia into their monastic state in the early 14th century. Meanwhile, the Ostsiedlung started to turn Slavic narrow Pomerania into an increasingly German-settled area; the remaining Wends and Polish people, often known as Kashubians, continued to settle within Pomerelia. 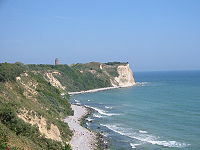 In 1325 the line of the princes of Rügen died out, and the principality was inherited by the Griffins. In 1466, with the Teutonic Order's defeat, Pomerelia became again subject to the Polish Crown as a part of Royal Prussia. While the German population in the Duchy of Pomerania adopted the Protestant reformation in 1534, the Polish (along with Kashubian) population remained with the Roman Catholic Church. The Thirty Years' War severely ravaged and depopulated narrow Pomerania; few years later this same happened to Pomerelia (the Deluge). With the extinction of the Griffin house during the same period, the Duchy of Pomerania was divided between the Swedish Empire and Brandenburg-Prussia in 1648, while Pomerelia remained in with the Polish Crown. Stralsund, one of several Hanseatic cities built in typical Brick Gothic style. Ruins of Augustinians' cloister in Jasienica, Police. Teutonic Knights' castle in Gniew, Pomerelia. The Prussian Province of Pomerania within Prussia and the German Empire circa 1871. Prussia gained the southern parts of Swedish Pomerania in 1720,:341–343 invaded and annexed Pomerelia from Poland in 1772, and gained the remainder of Swedish Pomerania in 1815, after the Napoleonic Wars. :363, 364 The former Brandenburg-Prussian Pomerania and the former Swedish parts were reorganized into the Prussian Province of Pomerania,:366 while Pomerelia was made part of the Province of West Prussia. With Prussia, both provinces joined the newly constituted German Empire in 1871. Under the German rule the Polish minority suffered discrimination and oppressive measures aimed at eradicating its culture. Following the empire's defeat in World War I, however, Pomorze Gdańskie/Pomerelia was returned to the rebuilt Polish state as part of the so-called Polish Corridor), while German-majority Gdansk/Danzig was transformed into the independent Free City of Danzig. Germany's Province of Pomerania was expanded in 1938 to include northern parts of the former Province of Posen–West Prussia, and in late 1939 the annexed Pomorze Gdańskie/Polish Corridor became part of the wartime Reichsgau Danzig-West Prussia. The Nazis deported the Pomeranian Jews to a reservation near Lublin in Pomerelia. The Polish population suffered heavily during the Nazi oppression; more than 40,000 died in executions, death camps, prisons and forced labour, primarily those who were teachers, businessmen, priests, politicians, former army officers, and civil servants. Thousands of Poles and Kashubians suffered deportation, their homes taken over by the German military and civil servants, as well as some Baltic Germans resettled there between 1940-1943. After Nazi Germany's defeat in World War II, the German–Polish border was shifted west to the Oder–Neisse line, and all of Pomerania was under Soviet military control. :512–515:373ff The German citizens of the former eastern territories of Germany and Poles of German ethnicity from Pomerelia were expelled, and the area was resettled primarily with Poles of Polish ethnicity, (some themselves expellees from former eastern Poland) and some Poles of Ukrainian ethnicity (resettled under Operation Vistula) and few Polish Jews. :381ff Most of Hither or Western Pomerania (Vorpommern) remained in Germany, and at first about 500,000 fled and expelled Farther Pomeranians found refuge there, later many moved on to other German regions and abroad. Today German Hither Pomerania forms the eastern part of the state of Mecklenburg-Vorpommern, while the Polish part is divided between the West Pomeranian and Pomeranian voivodeships, with their capitals in Szczecin and Gdańsk. During the 1980s, the Solidarity and Die Wende ("the change") movements overthrew the Communist regimes implemented during the post-war era; since then, Pomerania is democratically governed. Pomerania still lives in the country of Brazil in a colony where the language is still spoken. The arrival of Pomerania immigrants with Germans and Italians helped form the state of Espírito Santo since the early 1930s, from Gustavo Barreto. Their importance and respect are one of the cultural signatures of the area. Brazilian city Pomerode (state os Santa Catarina) was founded by Pomeranian Germans in 1861 and is considered the most typically German of all German towns of southern Brazil. Western Pomerania is inhabited by German Pomeranians. In the eastern parts, Poles are the dominating ethnic group since the territorial changes of Poland after World War II, and the resulting Polonization. Kashubians, descendants of the medieval Slavic Pomeranians, are numerous in rural Pomerelia. German Hither Pomerania had a population of about 470,000 in 2012 (districts of Vorpommern-Rügen and Vorpommern-Greifswald combined) - while the Polish districts of the region had a population of about 520,000 in 2012 (cities of Szczecin, Świnoujście and Police County combined). So overall, about 1 million people live in the historical region of Hither Pomerania today, while the Szczecin metropolitan area reaches even further. Section of a detailed map from Meyers Kleiner Hand-Atlas published by Julius Meyer in Leipzig and Vienna in 1892. In the German part of Pomerania, Standard German and the East Low German Mecklenburgisch-Vorpommersch and Central Pomeranian dialects are spoken, though Standard German dominates. Polish is the dominating language in the Polish part; Kashubian dialects are also spoken by the Kashubians in Pomerelia. East Pomeranian, the East Low German dialect of Farther Pomerania and western Pomerelia, Low Prussian, the East Low German dialect of eastern Pomerelia, and Standard German were dominating in Pomerania east of the Oder-Neisse line before most of its speakers were expelled after World War II. Slovincian was spoken at the Farther Pomeranian–Pomerelian frontier, but is now extinct. Kashubian and East Low German are also spoken by the descendants of émigrées, most notably in the Americas (e.g. Argentina, Brazil, Chile and Canada). For typical food and beverages of the region, see Pomeranian cuisine. The Pomeranian State Museum in Greifswald, dedicated to the history of Pomerania, has a variety of archeological findings and artefacts from the different periods covered in this article. 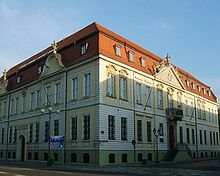 At least 50 museums in Poland cover history of Pomerania, the most important of them The National Museum in Gdańsk, Central Pomerania Museum in Słupsk, Darłowo Museum, Koszalin Museum, National Museum in Szczecin. Agriculture primarily consists of raising livestock, forestry, fishery and the cultivation of cereals, sugar beets, and potatoes. Industrial food processing is increasingly relevant in the region. Since the late 19th century, tourism has become an important sector of the economy, primarily in the numerous seaside resorts along the coast. Key producing industries are shipyards, mechanical engineering facilities (i.a. renewable energy components), sugar refineries, paper and wood fabricators. Service industries today are an important economical factor in Pomerania, most notably with logistics, information technology, life sciences/biotechnology/health care and other high tech branches often clustering around research facilities of the Pomeranian universities. ^ The American Heritage Dictionary of the English Language, Fourth Edition, 2000, Pomerania : "Pomerania is the medieval Latin form of German Pommern, itself a loanword in German from Slavic. The Polish word for Pomerania is Pomorze, composed of the preposition po, "along, by," and morze, "sea." The Slavic word for sea, more, which becomes morze in Polish, comes from the Indo-European noun *mori–, "sea," the source of Latin mare, "sea," and the mer- of English mermaid." ^ "Os pomeranos: um povo sem Estado finca suas raízes no Brasil" (in Portuguese). ^ "Muzeum Pomorza Środkowego - Strona główna". Muzeum.slupsk.pl. Retrieved 2010-07-30. ^ "Muzeum w Darłowie - Zamek Książąt Pomorskich zaprasza". Muzeumdarlowo.pl. Retrieved 2010-07-30. ^ "Muzeum w Koszalinie". Muzeum.koszalin.pl. Retrieved 2010-07-30. ^ "Muzeum Narodowe w Szczecinie - Aktualności". Muzeum.szczecin.pl. Retrieved 2010-07-30. Wikimedia Commons has media related to Pomerania. Herbermann, Charles, ed. (1913). "Pomerania" . Catholic Encyclopedia. New York: Robert Appleton Company. Chisholm, Hugh, ed. (1911). "Pomerania" . Encyclopædia Britannica (11th ed.). Cambridge University Press.